I've had quite a Benedictine week. Yesterday I was over at Downside Abbey in Somerset to collect the papers of the English Augustinian Canonesses of Paris (going back to the 1630s), which will now be housed in the Westminster Diocesan Archive. Yesterday happened to be the 400th Dies Memorabilis of the English Benedictine Congregation. This requires a bit of explanation. It refers to an event that took place in London (possibly in Holborn or St John's Wood) on 21 November 1607. Despite the Reformation, young Englishmen had continued to join religious Orders on the continent. At first, if you wanted to become a Benedictine you joined the Spanish or Italian (Cassinese) Congregations (the Benedictine Order exists in Congregations, originally organised on national lines) . In 1602 these English-born monks obtained a faculty from Clement VIII to join their secular and Jesuit counterparts on the English Mission. Two English members of the Cassinese Congregation, Robert Sadler and Edward Maihew, soon sort out the last surviving member of the original English Benedictine Congregation (EBC), which dated back to 1218/19. His name was Dom Sigebert (or Sebert) Buckley, then aged 90, who had formerly been a monk at Westminster Abbey during the community's restoration by Mary I. On 21 November 1607 Buckley aggregated these two young priests to himself - and through him to Westminster Abbey and the old Benedictione body in England. The ceremony was masterminded by the former lawyer and noted spiritual writer Dom Augustine Baker and it meant that the re-founded English Benedictine Congregation still claims to be the oldest Congregation in the Benedictine world. Today I was lucky enough to attend a half-day conference at Westminster Abbey to commemorate this great event. We listened to two talks in the magnificent Jerusalem Chamber, part of the original Abbot's Lodging, dating to the fourteenth century. The original ceiling can still be seen, under which Henry IV died in 1413. The King was about to make a pilgrimage to the Holy Land but suffered a stroke while praying at the shrine of St Edward. He was carried to this chamber and when he asked where he was, he was told he was in Jerusalem. The King had once been told that he would die in Jerusalem and so it came pass in the Abbey's Jerusalem Chamber. The most moving aspect of the conference, though, was to see monks and nuns walking around the great Abbey Church once again, just like the good old days. 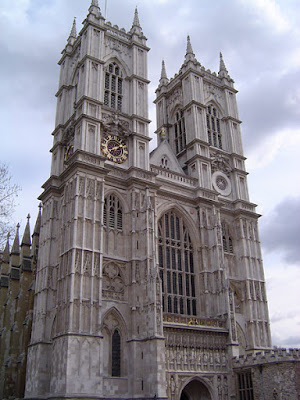 They included four current Abbots, an Abbess and the (titular) Abbot of Westminster (such titles are given to senior or retired members of the Congregation). Some of the tourists probably thought they were seeing ghosts! After Evensong (which included a Palestrina Magnificat and Peter Philips' Cantantibus organis, Cecilia), we gathered round the shrine of St Edward, more or less untouched by the Reformation, as the monks sang the responsary Posuisti Domine. Then we processed to the chapel of St Benedict, just off Poets' Corner, where the Suscipe was chanted. It was as if the centuries rolled back. Then I had to make a mad dash to Kingsland to preach at our parish Requiem for all those who have died over the last twelve months.